This ultra-nourishing daily hand and body lotion brings deep, enduring hydration. Jasons concentrated mixture of unrefined, virgin Coconut Oil and Shea Butter gets rid of the discomfort of particularly dry skin and softens and smooth’s rough patches. Skin will feel indulged and extremely soft and smooth. For best results, apply to slightly damp skin after washing hands and showering. Concentrate on dry areas like elbows, heels, and knees. Caution: For external use only. Keep out of reach of children. Avoid direct contact with eyes. If rash or irritation occurs, stop use and consult a physician. Aqua (Purified Water), Caprylic/Capric Triglyceride, Cocos Nucifera (Coconut) Oil*, Stearic Acid, Cetyl Alcohol, Glycerin, Glyceryl Stearate SE, Xanthan Gum, Citrus Aurantium Dulcis (Orange) Peel Oil, Ricinus Communis (Castor) Seed Oil, Punica Granatum Extract, Vitis Vinifera (Grape) Seed Extract, Tocopheryl Acetate, Allyl Caproate, Butyrospermum Parkii (Shea) Butter, Citric Acid, Ethyl Butyrate, Isoamyl Butyrate, Vanillin, Phenoxyethanol, Potassium Sorbate, Sodium Benzoate, D-Limonene. *Certified Organic Ingredient. The Jason Smoothing Coconut Hand & Body Lotion - 250ml product ethics are indicated below. To learn more about these product ethics and to see related products, follow the links below. 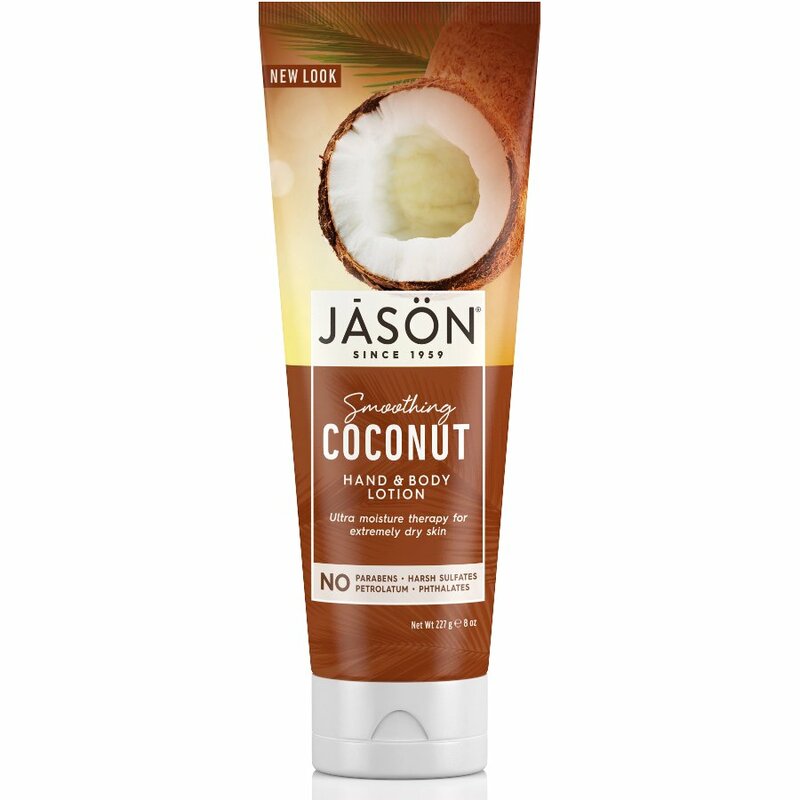 There are currently no questions to display about Jason Smoothing Coconut Hand & Body Lotion - 250ml. If you believe that what you put on your body is as important as what you put in your body, then Jason skin care products are for you. Combining the science of natural personal care with the best pure and natural ingredients, they provide an effective and environmentally friendly alternative to harsh chemical, mass produced products. Since 1959 JASON has been the foremost supplier of pure and natural toiletries and cosmetics. All JASON personal care products are produced in their own facility from botanicals, plant extracts, roots, herbs, proteins, vitamins, and minerals. If you crave high quality, luxury body care sourced only from natural ingredients then you should definitely try JASON.